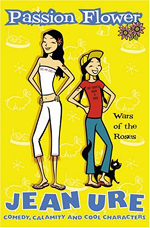 For a novel aimed at a middle grade audience, Passion Flower is surprisingly dark. Absent (emotionally or physically) and negligent parents seem to be a staple of modern Middle Grade and Young Adult fiction, but Jean Ure takes it to extremes here. At first, Stephanie and the Afterthought (sister Sam) just have to put up with their parents’ separation and their father moving south to Brighton. But then their mother decides she needs some time away from them and heads abroad to Spain, sending then to stay with their irresponsible father. While initially this involves him feeding them junk food and leaving them to fend for themselves, it quickly evolves into something a lot more scary and dangerous. It becomes a bleak account of just how irresponsible and selfish a parent can be. I think I would be fine with this if Passion Flower were an ‘issues’ novel, or even if there were something reassuring for readers at the end. Instead, however, it’s packaged as contemporary fluff, with a cartoon cover and a light-hearted blurb, and even reads as such for a good portion of the book. Due to this, I wasn’t really sure what to make of it. On the upside, Ure’s character voice is great and the first-person protagonist, Stephanie, is a likeable and believable character. The Afterthought is also very enjoyable and the two sisters have a realistic relationship. I also liked the background presence of Stephanie’s best friend, Vix, who provided a link to normality. Passion Flower is a quick read with a strong voice – but it packs a punch that younger readers may not be expecting.